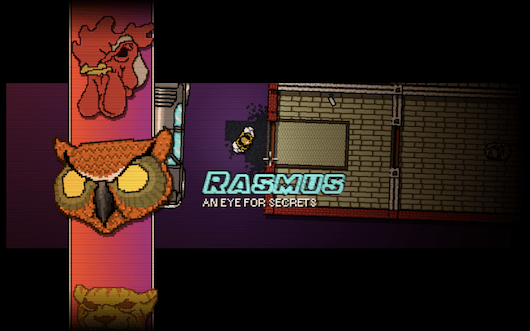 Recently I have noticed a lot of advertisements and friends talking about an independent release called Hotline Miami. I’ve been told by many (who forget that I don’t run a computer with Windows for a primary OS) to check it out. So I let curiosity get the better of me and decided to check it out. 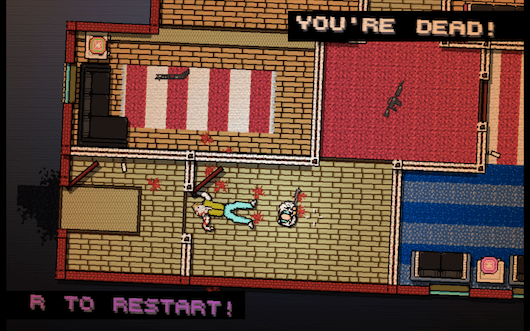 What I thought I was in for (from the screenshots and descriptions of the game) was shooting bad guys in buildings floor-by-floor to get to the next goal, which is then coated in retro-graphics and inspired by something that you would see on a SEGA Mega Drive. My first impressions when playing the game itself however, is that it’s a psychedelic journey of a person named Jacket, who starts off by being confronted by individuals wearing animal masks who are asking him questions about who he is and what he does. He then wakes up and proceeds to take orders from an answering machine in his apartment to undergo these missions that entail “cleaning out” properties of gangs and crooks. 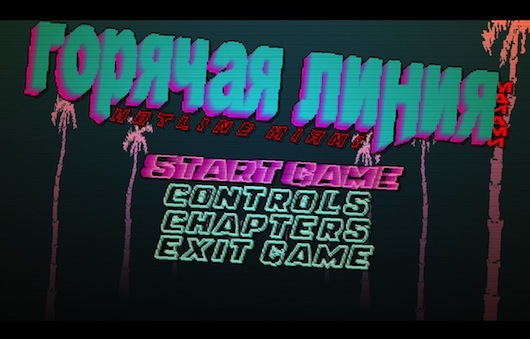 This game has an 8-bit/16-bit hybrid feel to it, with a soundtrack that is so immersive it takes you right back into Miami in 1989. Let me take a moment to delve into the soundtrack here. The music is probably one of the most eclectic mixtures I’ve ever heard in a video game. In fact, the last time I heard a soundtrack this eclectic was in a Katamari game. 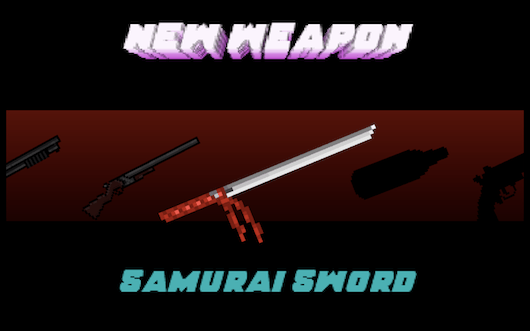 The music varies from the likes of independent musicians like Sun Araw, Perturbator and Jasper Byrne, to M.O.O.N. and many more. The overall mixture of genres vary from 80’s inspired dark electronica, to stoner surf rock, to down-tempo trip hop, to electro. I’m a sucker for music in video games as it’s an important facet which creates the atmosphere that intrinsically helps with telling a story, and this has to be one of the freshest soundtracks I’ve heard in a long, long time. As for the controls don’t use a trackpad like I have, because although it’s doable, it adds an extra challenge that is not necessary to an already-challenging game. You can either use a Keyboard and Mouse combination or if you have an Xbox 360 controller, you can whack one of them in for a more console-like experience. I couldn’t get my Xbox controller working in Windows 8 x64 Virtual Machine running the latest Parallels. Also I’ve found that the game crashes when trying to access the menu sometimes. With the issues of running games in Windows aside…. 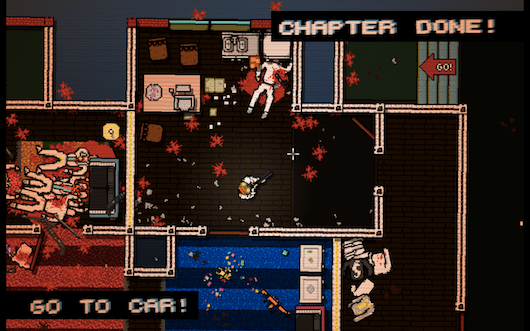 Overall, if you’re after a challenging title with plenty of levels, wanton violence, guns and a rockin’ soundtrack to boot, then Hotline Miami is the way to go! This game is available now on Steam and Good old Games for Windows with a Mac port in development with an imminent release. 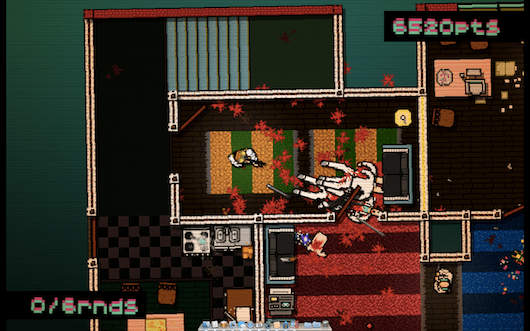 UPDATE: 20/03/2013 – Hotline Miami is available now for OSX via Steam and soon on Good Old Games!